Create a comfortable and attractive eating space that fits your family size, entertaining needs, and dining room capacity with this pewter brown round 5 piece dining set from RC Willey. With its beautiful finish, 18-inch leaf, timeless look of the single pedestal, and the upholstered barrel chairs you'll be looking for every reason to sit down and enjoy this versatile piece with those closest to you. Includse table and four barrel chairs. 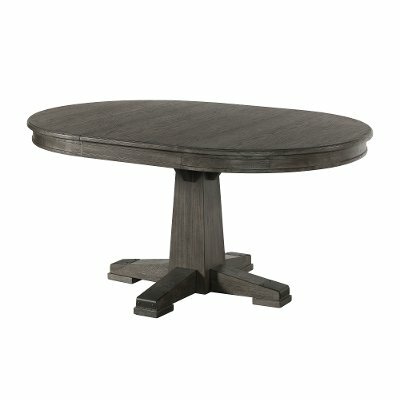 Create an eating space that fits your family size, entertaining needs, and dining room capacity with this pewter brown round dining table from RC Willey. With its beautiful finish, 18-inch leaf, and the timeless look of the single pedestal, you'll be looking for every reason to sit down and enjoy this versatile piece with those closest to you. This barrel upholstered dining chair from RC Willey is what comfortable dining is all about. Crisp, clean lines combined with soft curves and textures create a calming, balanced look for a dining area or living room. 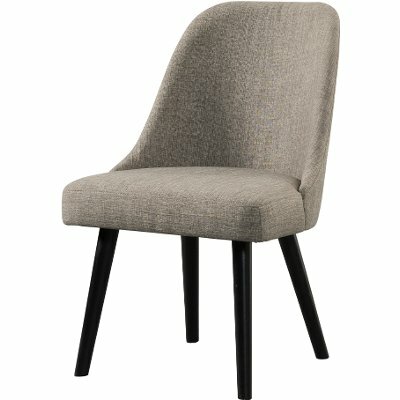 With mid-century modern aesthetics, this chair is a stylish and timeless choice for your home. 18" leaf expands the table from 42" to 60"